I am out of the suburbs and into the city—at the center of what I wanted. Staying with my host family forty-minutes from town was a gift. It allowed me to ease in and find a job in a protected place. But, I didn’t leave Asia for the outskirts or to be protected. I left to be exposed to the thriving madness of Europe. The flat I am renting is in the art district of Prague, three metro stops from the city center. The Vltava River is a two-minute walk as are countless restaurants, pubs and galleries. Red retro tram cars pass by my window at regular intervals. Outside the city hums. Inside it is quiet. I live alone. The writer and reader in me loves living alone. The solitude is a perfect and necessary conduit for creativity. The social animal in me paws at the door needing to get out. Hearing and telling stories, using the words bouncing around in my head is a big part of who I am. I don’t have any friends here. I will, but these things take time. As a new man in the city finding friends means going out alone. That may sound lonely and I suppose it can be. But, I’ve chosen to live an adventurous life; unsettled—without debit or commitment. A world of flash and burn with blips of darkness between. 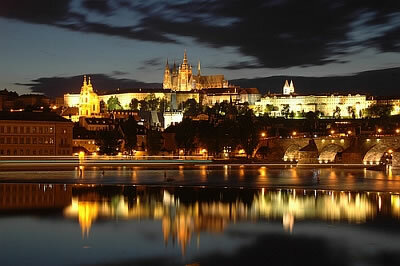 Prague is a tourist mecca, there is no such thing as a down night. Thursday evening I made a simple dinner at home and washed it down with a good Czech beer. Outside my window the streets and the tram cars were packed with people going places. I decided that I should go some place too. Using my formidable research powers I Googled “best bars in Prague” and wrote down the addresses of my desired destinations. I took the metro into the city center. Prague is gorgeous at night. The city seems to have a million Gothic structures with high reaching spires and at night they are all perfectly lit. It is fairytale made real down every street and every alley. I stopped in Old Town Square and ordered a beer. I stood at an outside table watching the passing show. Tourists from around the world shuffled by. Street musicians jammed. Groups of early drinkers stumbled and yelled. A beautiful girl, clearly a local pushed by looking unhappy with the crowds. There were hundreds of beautiful girls out that night, but she stood out and for a moment I imagined what we would be like together. She wouldn’t think much of me at first, but one night at a mutual friend’s house we would get to talking and people would leave us alone because we were in a different place. At the end of the night I would ask her to have dinner with me and she would say yes. She would sound reluctant doing it but I would see that she was secretly pleased. Our first date would last for three days and at its end we would belong to each other. I would be intimidated by her sophisticated friends and do my best not to show it. I would be surprised by her willingness to compromise when I was in the mood for cheap eats and dirty bars. She would love my writing and be my harshest critic too and that juxtaposition would push me to be better. I would fight falling in love and despite my best efforts I would fall anyway. In the end she would break my heart. There would be tears but no reason, simply the end of an affair destined to end. Another flash and burn in a series of. The first bar I went to was bright and loud and totally empty. I had walked down two flights of stairs to reach it and my buzz was fading so I ordered a beer anyway. By the time I finished that beer the bar was still empty so I left. The second place I went was packed. It was a decidedly tourist crowd and everyone was stoked to be partying in Prague. If I was with friends I would have stayed. If I was drunker I would have stayed. I was on my way up and they were already there so I moved on. I walked along narrow streets aiming for the general direction of the Charles Bridge. A light rain started to fall so I stopped at a pub on the river’s edge. I ordered a dark beer and sat at an outside table under an umbrella. 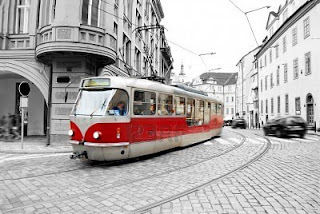 The rain made the cobble stone streets glisten and the red trams shine. Across the river Prague Castle loomed over the horizon and the dome of St. Nicolas church peeked above the trees. A flock of white geese swam lazily by. And not far down 300 rowdy travelers jostled and pushed waiting to be let into a place billing itself as the “biggest club in Central Europe.” The madness of the continent all around. I took a tram through scenic streets back to my neighborhood. I was planning to call it a night, but decided to stop at the club directly across the street from my flat. I walked in and realized instantly that I had been there before. Five years ago I visited Prague following a business trip. My last night in the city we went to a club; a locals only place that at the time seemed to be in a sketchy neighborhood. It was a wild night spent with friends I’d made at the hostel—great friends. Walking back into that club and realizing that it was across the street from the place I now lived hit me with a wave of happiness and nostalgia. A band was playing and they were great. At the end of their set I had one more drink and went home. I didn’t make any friends that night. But, I experienced new things and I ended with an unexpected dose of nostalgia that made the adventure worthwhile. Today is Saturday. I am going to read. I am going to write. I am going to ride a bike along the banks of the Vltava River. And when night falls I am going to go out again. Maybe I’ll make friends and maybe I won’t. For the world to flash and burn I have to try.